Imagine if you could be rewarded for making healthy lifestyle changes. The first national wellness rewards program is here. Carrot Rewards is now available to download free of charge. This app is brought to you in partnership with Social Change Rewards, the B.C. Ministry of Health, the BC Alliance for Healthy Living, the Public Health Agency of Canada, along with partners YMCA Canada, Heart & Stroke Foundation, and the Canadian Diabetes Association. 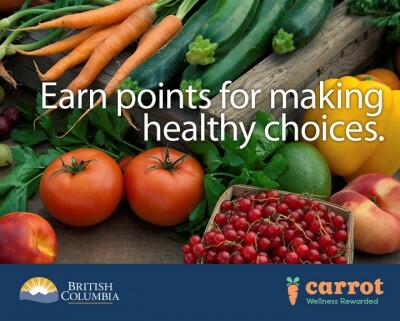 Carrot Rewards will reward you with your choice of loyalty points for learning practical tips on healthy living. You can exchange these points for big rewards! Download the app to your smart phone from either iTunes or Google play. Carrot Rewards is available exclusively to British Columbia residents right now, but will expand to other provinces and territories in the future. Download Carrot Rewards and start earning points today. The real reward is how good you’ll feel after you start making healthier choices a regular part of your lifestyle!